You’re enjoying Spotify basic right? Globe will give you free Spotify Premiun access where you can level up you music listening habit. You won’t be able to hear ads anymore, enjoy unlimited skips and listen to your favorite songs offline. To avail this free service, you need to have a Globe SIM that can receive the activation code for verification purpose. Steps below is what I did to enjoy Premium account of Spotify. Using my Globe SIM, I texted the keyword FREE SPOTIFY PREMIUM to 8888. I receive a notification message confirming that I now have free access to Spotify Premium. Go to the link included on SMS message to activate your account. Do note that this needs internet connection to process the activation. Once you’re on the link page, you need to enter your 11 digit mobile number and click Send button. You will receive another SMS again containing the verification code. After you receive the verification code, enter it on the verify page then click Submit. Once you click submit you will ask to allow Globe to access you Spotify account information. Just click Allow to continue. After that page, you will be prompted to login your Spotify account. Log the account you are using to stream Spotify. After that, a message on the page says you’re ready to play. Details also include the expiry date of your premium account. Go to your Spotify App on your mobile, PC or tablet and login your account. You can now enjoy 24/7 Spofity music but of course you need data to access internet for streaming to work. 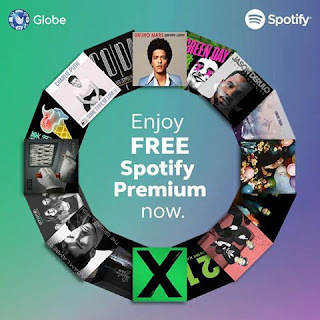 Some Globe promos include free Spotify, you may try subscribing on it or you can try 7 days 1GB internet for only 70 pesos and it includes free 1000 free texts also.